Strength training is an important component of athletic performance improvement, along with sport-specific skill development; nutrition; rest and recovery; and mental preparation. And, while traditional weight lifting exercises should be part of every athlete’s strength and conditioning program, don’t ignore or underestimate the impact that body-weight exercises can have on your development. Pullups work the entire upper body and — performed correctly — lead to improvements in strength. If you can’t (yet) do a pullup, use a TRX suspension trainer, resistance band, or spotter to assist. Beginners can also start with the lat pulldown exercise. Pushups are another great upper-body exercise, because they engage the chest, shoulders, back, and arms. Master the basics first, then modify the exercise by placing medicine balls under your hands, use the TRX, elevate your feet, experiment with different hand positions, wear a weighted vest, or try them inverted (the inverted row is another of our favorite body-weight exercises, performed with a bar or TRX). Lunges target the entire lower body, working the big muscles like the glutes and quads. This versatile exercise can be varied by doing it stationary; walking forward, backward, or laterally; angled; and cross-over or cross-behind. If you’re not already doing them, add these exercises to your regimen. They can be performed virtually anywhere. I am an advocate of unilateral (single-leg) training exercises of the lower body (for that matter the upper body also). When you consider the forces that athletes must overcome on one leg in stopping and starting it makes sense to train unilaterally. That does not mean that bilateral exercises — like regular squats — are not part of the routine. 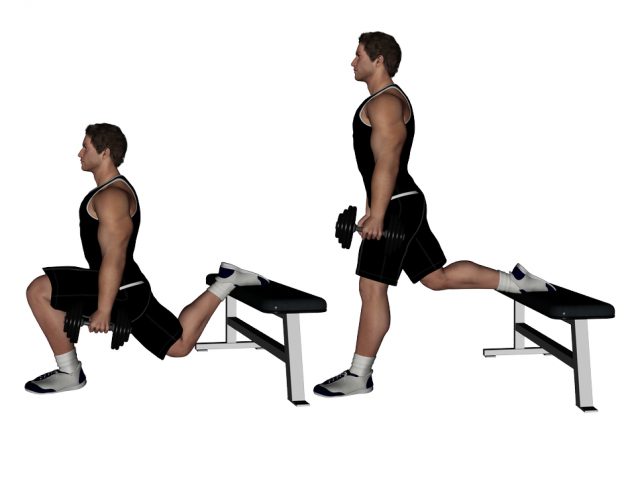 Unilateral exercises should be used to complement bilateral exercises, perhaps on an alternating, bi-weekly basis. Unilateral exercises can not only improve strength, but also balance, stability, and injury risk reduction. You can further increase the degree-of-difficulty of some of these (non-impact) exercises by using an unstable surface, such as an Airex balance pad. Athletes spend a lot of time on their feet. As a result of impact, fatigue, and overuse, the incidence of leg injury increases. Research shows that hip muscle weakness increases the risk of injuries like chronic knee pain, shin splints, Achilles tendonitis, and pain in the sole of the foot. Since the muscles of the hip are important for stabilizing the leg during running, jumping, and other lower-extremity movement, weakness of these muscles can lead to less control of the legs and an increase in the risk of injury. Hip muscle training can not only build up protection from future injuries, it can also help to alleviate pain from various running-related injuries, according to various studies. Try hip-strengthening exercises like squats, deadlifts, lunges (pictured, with sandbag), and glute bridges. Pullups work the entire upper body and — performed correctly — lead to improvements in strength. If you can’t (yet) do a pullup, use a TRX, band, or spotter to assist. Beginners can also start with the lat pulldown exercise.